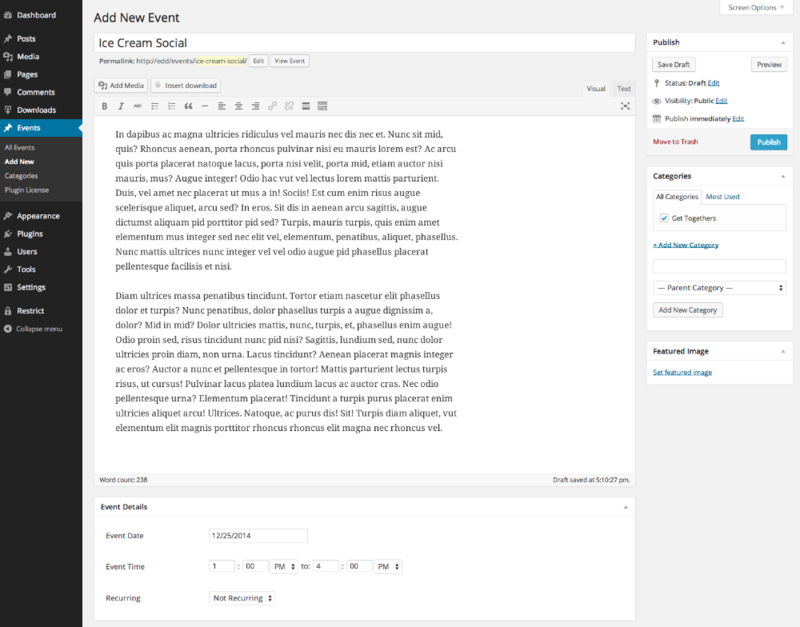 Creating events is as simple as adding a WordPress post or page. From your WordPress Dashboard, click on Events and Add New. On this page, you will be presented with the normal WordPress editor. Fill in the event title, description, and featured image (if desired). If you wish, you can categorize your event into appropriate sections. When showing event calendars, you have the option of limiting the calendar to only show events from specified categories. Once you have added the event title, description, image, and categories, scroll down to the "Event Configuration" and select a date and time for the event. The "Event Date" field should be set to the day, month, and year that the event occurs. The "Event Time" fields should be set to the time of the day that the event starts and the time of day (or night) that the event ends. As soon as you are finished adding in all information, click "Publish", or "Update" if you are modifying an existing event.